Halloween with Tomi and Mimi is always sweet, not because of the treats…But because they choose to be cute sweet animals. Tomi and Mimi are not really into scary halloweens. So when they are asked what they want to be, they will say something like ‘a sheep’ or ‘a bunny’. This year was no different. You can make this simple halloween costume too! Maybe you even have some supplies already left over from our other crafts. Like the Felt Flap Book or the Puppets of Yourself that Tomi and Mimi made. For this craft Tomi and Mimi attached the ears to a headband, but you can also attach them to a woolen hat. This would look great with lamb ears and a white woolen hat, as you can see in the picture at the bottom of this post. You just need to cut out the ears 4 times. Easiest way to do this is, is to fold the felt double. Cut out an ear, for example cat ears or bunny ears. Then trace the cut out ears on left over (folded) felt and you have 4 ears. 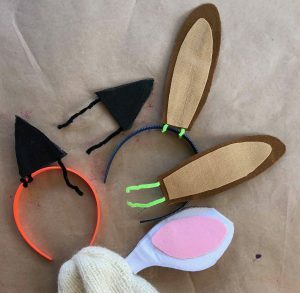 If you want bunny ears, it looks nice to cut out 2 smaller size ears in a lighter color and stick them onto the front of the ears. Now bend the pipe cleaner in the shape of your cat ear. Peel off the paper to expose the sticky side. Arrange the pipe cleaner on the ear and make sure that about an inch of both ends stick out on the bottom. These ends are going to be wrapped around the hairband later. Now peel off the paper of the back of the ear and stick it needly on the part with the pipe cleaner on it. Your first ear is ready! If your making bunny ears, your pipe cleaners are not long enough to go all the way up your ear and stick out at the bottom. Tomi and Mimi just made a small loop at the bottom of the ear so that the pipe cleaners could stick out like above. PLUS they made another loop to go all the way up the ear just to create extra firmness to the long bunny ears. After sticking the pipe cleaners in this way you can go ahead and peel and stick the back of the ear onto it. 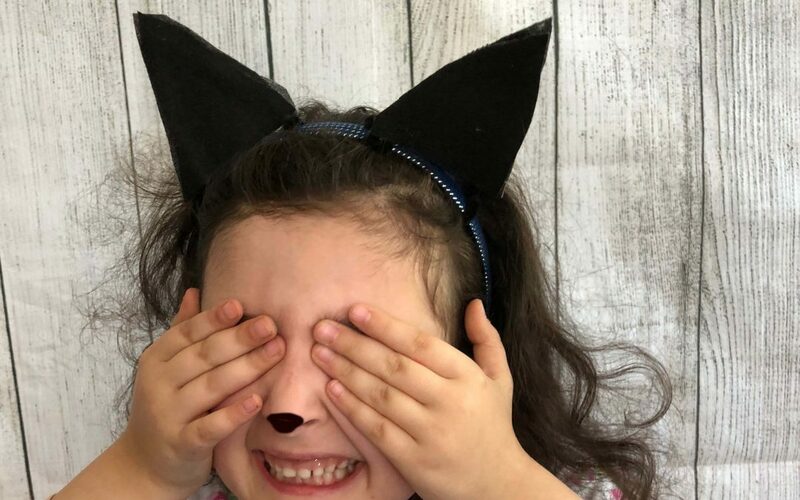 Now that your ears are done, you can simply fold the pipe cleaner ends that are sticking out around your hairband and you have your Simple Halloween Costume Ears done! In case you are missing supplies, here are some suggestions that will take you to Amazon when you click. By doing so Tomi and Mimi will receive a little bit of your purchase money so they can continue sharing crafts and things to do with you! Now find some matching clothes, like a black dress or a brown t-shirt and ask your mom to put a little eye pencil on your nose and whiskers on your cheeks to make your easy Halloween costume complete! Tomi and Mimi hope you will have a wonderfully sweet Halloween, just like them.